BOSTON (AP) Al Horford captured the attention of Boston sports fans even on Super Bowl Sunday. 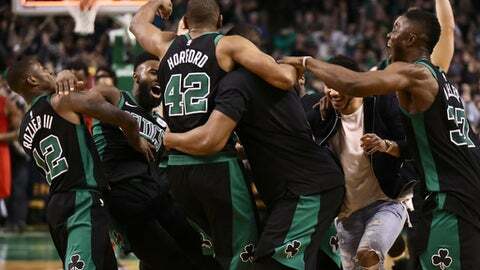 ”Wanted to end the game so we could go watch the Super Bowl,” Celtics coach Brad Stevens said. ”I called game when Al hit the turnaround, just so you know,” Morris said. Damian Lillard shot just 6 for 19, but scored Portland’s final eight points, including a 3-point play with 7.2 seconds remaining to give the Blazers a 96-95 lead. Irving missed his third straight game with a bruised quad. … Morris missed his second with a hip injury and Shane Larkin was out for the fourth straight. Trail Blazers: Maurice Harkless hit a career-high five 3-pointers and finished with 19. Harkless had 20 points in Portland’s last 13 games. … Portland has dropped six of eight on the road. Celtics: Boston had more 3-pointers in the first half than two-pointers (8-5). This was the 10th time this season the Celtics have overcome a double-digit lead. Boston is 15-5 against the Western Conference. Trail Blazers: Visit the Detroit Pistons on Monday night. Celtics: Visit the Toronto Raptors on Tuesday night.